For other uses, see Blubber (disambiguation). Blubber is a thick layer of vascularized adipose tissue found under the skin of all cetaceans, pinnipeds and sirenians. Lipid-rich, collagen fiber-laced blubber comprises the hypodermis and covers the whole body, except for parts of the appendages, strongly attached to the musculature and skeleton by highly organized, fan-shaped networks of tendons and ligaments. It can comprise up to 50% of the body mass of some marine mammals during some points in their lives, and can range from 2 inches (5 cm) thick in dolphins and smaller whales, to more than 12 inches (30 cm) thick in some bigger whales, such as right and bowhead whales. However, this is not indicative of larger whales' ability to retain heat better, as the thickness of a whale's blubber does not significantly affect heat loss. More indicative of a whale's ability to retain heat is the water and lipid concentration in blubber, as water reduces heat-retaining capacities, and lipid increases them. Blubber is the primary storage location of fat on some mammals. It is particularly important for species that feed and breed in different parts of the ocean. During these periods, the animals metabolize fat. Blubber may save energy for marine mammals such as dolphins, in that it adds buoyancy to a dolphin while swimming. Blubber differs from other forms of adipose tissue in its extra thickness, which allows it to serve as an efficient thermal insulator, making blubber essential for thermoregulation. Blubber is more vascularized—rich in blood vessels—than other adipose tissue. Blubber has advantages over fur (as in sea otters) in the respect that although fur can retain heat by holding pockets of air, the air pockets will be expelled under pressure (while diving). Blubber, however, does not compress under pressure. It is effective enough that some whales can dwell in temperatures as low as 40 °F (4 °C). While diving in cold water, blood vessels covering the blubber constrict and decrease blood flow, thus increasing blubber's efficiency as an insulator. Blubber aids buoyancy, and streamlines the body because the organized, complex collagenous network supports the noncircular cross sections characteristic of cetaceans. Research into the thermal conductivity of the common bottlenose dolphin's blubber reveals its thickness and lipid content vary greatly amongst individuals and across life history categories. Blubber from emaciated dolphins is a poorer insulator than that from nonpregnant adults, which in turn have a higher heat conductivity than blubber from pregnant females and adolescents. Uqhuq or uqsuq, ("blubber" in the Inuktitut language) formed an important part of the traditional diets of the Inuit and of other northern peoples because of its high energy value and availability. Seal blubber contains large amounts of vitamin E, selenium, and other antioxidants, which may reduce the effect of the free radicals formed within the body's cells. (Damage caused to cells by free radicals is a theorized contributor to oxidative diseases.) Whale blubber, which tastes like arrowroot biscuits, has similar properties. The positive effects of consuming blubber can be seen in Greenland; in Uummannaq for example, a hunting district with 3,000 residents, no deaths due to cardiovascular diseases occurred in the 1970s. However, emigrants to Denmark have contracted the same diseases as the rest of the Danish population. The average 70-year-old Inuit with a traditional diet of whale and seal has arteries as elastic as those of a 20-year-old resident of Denmark. Whaling largely targeted the collection of blubber: whalers rendered it into oil in try pots, or later, in vats on factory ships. The oil could serve in the manufacture of soap, leather, and cosmetics. Whale oil was used in candles as wax, and in oil lamps as fuel. A single blue whale can yield a blubber harvest of up to 50 tons. Blubber from whales and seals contains omega-3 fatty acids and vitamin D. Without the vitamin D, for example, the Inuit and other natives of the Arctic would likely suffer from rickets. There is evidence blubber and other fats in the arctic diet also provide the calories needed to replace the lack of carbohydrates found in the diets of cultures in the rest of the world. Blubber contains PCBs, carcinogens that damage human nervous, immune and reproductive systems. The source of PCB concentrations is unknown. Since toothed whales are high on the food chain, they likely consume large amounts of industrial pollutants (bioaccumulation). Even baleen whales, by merit of the huge amount of food they consume, are bound to have toxic chemicals stored in their bodies. There are high levels of mercury in the blubber of seals of the Canadian arctic. ↑ Struntz, D.J. ; McLellan, W.A. ; Dillaman, R.M. ; Blum, J.E. ; Kucklick, J.R.; Pabst, D.A. (2004). "Blubber development in bottlenose dolphins (Tursiops truncatus)". Journal of Morphology. 259 (1): 7–20. doi:10.1002/jmor.10154. PMID 14666521. ↑ Kvadsheim, P.H. ; Folkow, L.P.; Blix, A.S. (1996). "Thermal conductivity of minke whale blubber". Journal of Thermal Biology. 21 (2): 123–8. doi:10.1016/0306-4565(95)00034-8. ↑ "Bouncy Blubber". Science Update. AAAS. ↑ "Secrets of the Ocean Realm". ↑ Don Galbraith et al. Biology 11. (Canada: McGraw-Hill Ryerson). pg. 12. ↑ Dunkin, R. C. (2005). "The ontogenetic changes in the thermal properties of blubber from Atlantic bottlenose dolphin Tursiops truncatus". Journal of Experimental Biology. 208 (8): 1469–80. doi:10.1242/jeb.01559. PMID 15802671. ↑ Ohokak, G.; M. Kadlun; B. Harnum. Inuinnaqtun-English Dictionary (PDF). Kitikmeot Heritage Society. Retrieved 6 March 2013. ↑ Stefansson, Eero; Adriaensen, Arxontis (1893). Missionärer bland Eskimåer [Missionaries Among the Eskimos]. Uppdrag i Världen (in Swedish). Göteborg: Himmelriket på Jorden Publikationer. p. 138. ↑ "Orsoq - Eat Meat and Blubber from Sea Mammals to avoid Cardiovascular disease.". Archived from the original on 2012-02-25. ↑ Donovan, Greg (2008). "Whaling". Microsoft Encarta. ↑ "Cetacean". Encyclopædia Britannica. Ultimate Reference Suite. 2008. ↑ Kuhnlein, H.V. ; Barthet, V.; Farren, A.; Falahi, E.; Leggee, D.; Receveur, O.; Berti, P. (2006). "Vitamins A, D, and E in Canadian Arctic traditional food and adult diets". Journal of Food Composition and Analysis. 19 (6–7): 495–506. doi:10.1016/j.jfca.2005.02.007. ↑ Teuten, E. L.; Xu, L; Reddy, CM (2005). "Two Abundant Bioaccumulated Halogenated Compounds Are Natural Products". Science. 307 (5711): 917–20. doi:10.1126/science.1106882. PMID 15705850. 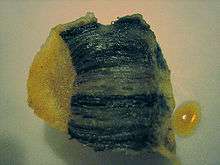 Lay summary – ScienceDaily (February 18, 2005). ↑ "Japan warned on 'contaminated' blubber". BBC News. 2001-01-24. Retrieved 2009-12-31. "Education Resources for Teachers--Blubber Experiment".